Thessaloniki, 1917. As Dimitri Komninos is born, a fire sweeps through the thriving multicultural city, where Christians, Jews and Moslems live side by side. It is the first of many catastrophic events that will change for ever this city, as war, fear and persecution begin to divide its people. Five years later, young Katerina escapes to Greece when her home in Asia Minor is destroyed by the Turkish army. Losing her mother in the chaos, she finds herself on a boat to an unknown destination. From that day the lives of Dimitri and Katerina become entwined, with each other and with the story of the city itself. Thessaloniki, 2007. A young Anglo-Greek hears the life story of his grandparents for the first time and realises he has a decision to make. For many decades, they have looked after the memories and treasures of people who have been forcibly driven from their beloved city. Should he become their new custodian? Should he stay or should he go? A few months ago I read this author's debut novel, The Island, and really loved it! Like that first book, this one is set in Greece, this time in the coastal city of Thessaloniki. It is a city that I knew very little about. Probably the only thing that came to mind was that there were a couple of letters to the Thessalonians in the New Testament of the Bible. What that tells us is that there is a long and rich history of the city, so it was probably wise of the author to concentrate pretty much on the events of the 20th century. When the main part of the novel opens, it is 1917 and the city is populated by a roughly equal mix of Muslims, Jews and Greeks and for the most part the different groups living peacefully together. This is especially true on Irini Street where families live together in harmony, children playing together on the street, everyone close to each other. The book is primarily the story of Dimitri Komninos and his wife Katerina, how they met and came together. It is fitting then that the novel opens on the day of Dimitri's birth, the much longed for son of Olga and Konstantinos. Konstantinos is a successful businessman and Olga his much younger trophy wife. We learn pretty early on what kind of man Konstantinos is and where his priorities lie. The baby's birth is a spot of good news in an otherwise terrible day for the city as this is the same day that most of the old city is destroyed by a devastating fire but rather than giving his family the priority for Konstantinos it is all about his business. With their home destroyed, Olga moves to Irini Street, much to her husband's disgust. On another devastating day in another city, a young girl finds herself also fleeing from a fire that is destroying lives. In this case, the city is Smyrna in Turkey and the fire is precipitated by the terror of the Greco-Turkey war that was raging (an event that I had previously read about in Middlesex by Jeffrey Eugenides). As part of the agreements of that war, there was to be a swap of people. All the Muslims who lived in Thessaloniki were ordered to leave the city, and all of the ethnic Greeks who lived in Turkey were relocated back to Greece, with many thousands of them finding their way to Thessaloniki, a city that was ill prepared for such a population explosion. In the chaos of the people swap, a young girl is separated from her mother who is destined to Athens. Suffering from a large burn on her arm, Katerina is taken care of by Eugenia and finds herself loaded onto a boat to Thessaloniki with Eugenia and her twin daughters, and soon they too live in Irini Street, and so they initial relationship between Dimitri and Katerina begins. As they grow towards adulthood, Dimitri has to fight his domineering father about his future career choice, and then ends up having to fight for his beliefs, and Katerina finds her passion in life - needlework. Soon she is one of the most sought after seamstresses in the city, and there is a lot of page time spent on the various skills she possesses and the garments that she helps to make. One of the effects of the people swap is that the city goes from being one that was populated by roughly equal mix of religious beliefs to one where the Jewish are the minority and the Muslims are gone. Whilst there is no immediate effect, it is definitely felt as the events in world history march unerringly on towards the Nazi occupation of Greece, with inevitable consequences. Even when the war is over, there is still civil upheaval as the damaged country tries to find its way out of the dark days of World War II and into the future. It is interesting to follow our main couple through these various upheavals, and see the consequences of their actions and beliefs, especially to see how some of those consequences had life long impacts on the choices that were available to them. I really enjoyed getting to see this particular glimpse of Greek history, although I did have a couple of reservations. There were a couple of two dimensional characters, especially Konstantinos. I also wasn't sure about the use of the modern framing device. The novel opens with their grandson coming to visit an elderly Dimitri and Katerina, and for the first time hearing their story; how they met, what they went through, how they came together and more. Whilst I do normally like that kind of framework, this time it didn't quite work for me. I did also feel that the story kind of meandered a bit as it got towards the end, but this is really a minor complaint. 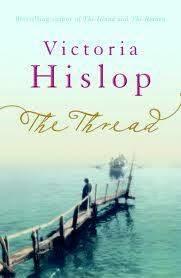 I still have Victoria Hislop's second book, The Return, here to read. That one is set in the Spanish Civil War. Whilst I am interested to read that one, it is clear that Hislop has a passionate interest in Greece and its people and history. It is interesting to note that as an author she is hugely popular in Greece. The Island was even made into a 26 part TV series! I hope to hear that her next book is once again set in Greece. Oh good. I hope you like it! I am planning to read The Return soon.